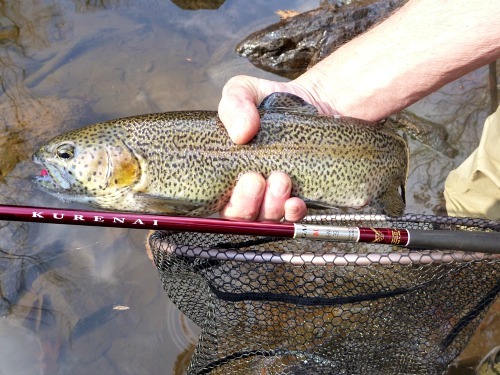 The Suntech Kurenai rods are just delightful rods for little wild brookies (or greenbacks, or goldens, or redbands). They are to the average tenkara rod what a tenkara rod is to the average fly rod. They are light, they are sensitive, they are incredibly fun to fish with. The Suntech Kurenai HM30R is a 3 meter rod (9' 7") that weighs just .9 ounce. The rod has a wonderful feel to it. With a size 3 level fluorocarbon line, it almost casts itself. Even though size 3 level line is a light line, you can feel the rod load as you begin your forward cast. These rods will spoil you. 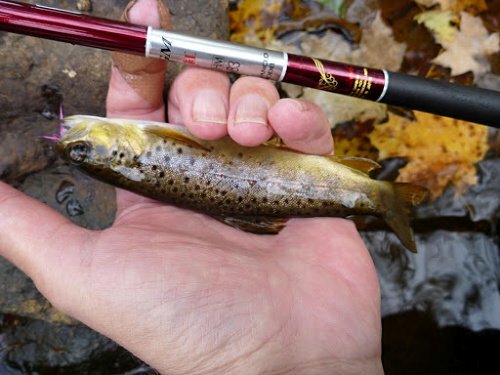 If you're not already obsessed with little wild trout in little wild streams, after fishing with these rods you will be. 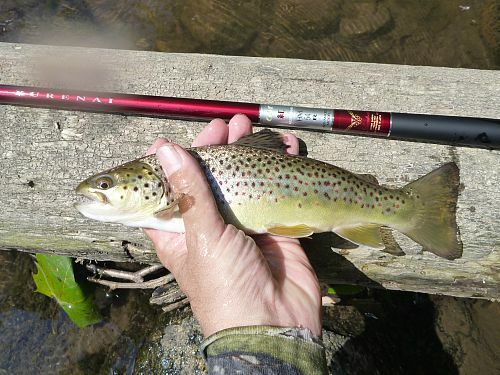 The rod's action is just perfect for the 4" to 8" trout one would find in such streams. The rod has enough reserve backbone to handle the unexpected 10 or 12 incher, but a fish of that size will give you a fight you won't soon forget. The longer HM33R and HM39R rods will handle larger fish, and several customers have reported memorable catches of trout in the mid teens. The HM30R is not a rod for the main stream, or even the larger tributaries. It is a headwaters rod. A rod for people who delight in finding and following the narrow blue lines on the topo maps. I first got in the HM30 rods to take to the 2012 International Fly Tying Symposium, where I sold every last one of 'em - before I even had a chance to write a page for them. At the show, all we had to do is put a rod in someone's hand (and watch as their eyes got wide, their jaw dropped and they said "Wow! "), then put a line on the rod, have them making beautiful casts in just a couple minutes, and then write up another sale. They really are that nice. Even today, people who've heard about the rods but never seen one say "wow" when they pick it up. I warn people that this rod will cast a spell on you. If you even touch it you will want it. The Suntech HM33R, which is the next longer rod, is 11'2" and almost as light at just 1.1 ounces. The casting feel is very similar. 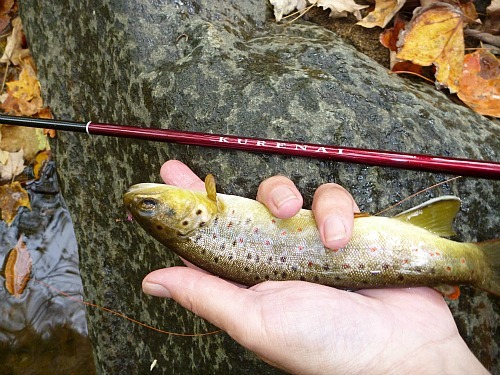 Most of the medium to small streams that tenkara anglers fish are wide enough to use an 11'2" rod. The "standard" length of tenkara rods in Japan is probably the 3.6 meter rod, which generally run from 11'6" to 11'10" in length. The Suntech Kurenai HM33R is just a few inches shorter than the average tenkara rod yet weighs less than half as much. It will easily handle the fish that Japanese tenkara anglers catch, which mostly run 8-10". For that matter, it will easily handle most of the trout that US anglers catch, which on average are probably only a few inches longer. By the way, the HM33R also makes a dandy bluegill rod! It will cast far enough to reach them, it is sensitive enough to transmit the smallest "tick" when they take the fly, and boy will they put a bend in it! The HM39R rods, at 12'10", may not be headwaters rods anymore, but if you have casting room for a 13' rod they really will spoil you. They weigh 1.5 ounce - less than half as much as most 13' rods. They aren't tip heavy! You'll never again be able to pick up a 3.6 ounce 13' rod and think it is anything but clunky. Regular readers know that I often fish with a friend I call "Coach" (because with his coaching his granddaughter won both largest fish and smallest fish at a local fishing contest). The Kurenai HM39R is his "go to" rod. He likes it primarily because it is so light but also because it is surprisingly capable. He's caught trout to the mid teens with it, as well as hand size bluegills and bass up to a couple pounds. And despite my descriptions of the rod as a light rod with an incredibly soft and sensitive tip, he generally fishes the rod with a tungsten bead head nymph and a half inch thingamabobber. The tip is indeed soft, but there's some backbone behind it. On a slightly wider stream, the Suntech Kurenai HM45R is just a truly sweet rod. It has all the reach of an Ito, yet weighs less than half as much. For fish into the 15-16" range it is just more pleasant to fish with than any of the other 4.5m rods out there. The longest of the Kurenai rods, the HM54R and HM63R are fun rods for modest fish in bigger waters. They are the lightest rods you'll find for their length. Who would have thought a 17.5' rod would weigh less than 3 ounces? Who would have thought a 21' rod would weigh less than 4 ounces? New York stocks 9 1/2 to 10 1/2 inch trout. These rods are just ideal for those fish, and also for the holdovers, which are generally in the 13-14" range. Coach has caught 15+" trout on his HM39R and I'm sure the longer rods could handle fish a bit larger than that. I think they would also be ideal for fishing ponds or lakes for bluegills and crappies or pretty modest bass. I would stay with the Fujino 6.5X tippet from Japan, right at the Japanese line size .5, which is the most the rods are rated for. You can use the longest of the Suntech Kurenai rods for keiryu fishing if you know the waters and know you will not hook any large fish. This 14+" brown trout was caught with a a Suntech Kurenai HM63R and a light keiryu rig with 8X tippet to protect the rod. It worked just fine. For modest fish in bigger water, it just doesn't get any better! After having had these rods for a couple years now, and after having done micro fishing for quite some time, it finally dawned on me that the HM30R is also a superb micro fishing rod. While it is considerably longer than all the other rods I list for micro fishing, at times a bit more length is an advantage. What sealed the deal, though, was recognizing how amazingly sensitive the tip is - even compared to the other micro fishing rods. I caught a 2" bluegill and was really a bit surprised that it put a good bend in the rod tip. This is a rod whose tip will bend from the fight of an extremely small fish, yet not be at risk if your extremely small fish gets eaten by a much larger one as you are bringing it in - which has happened! 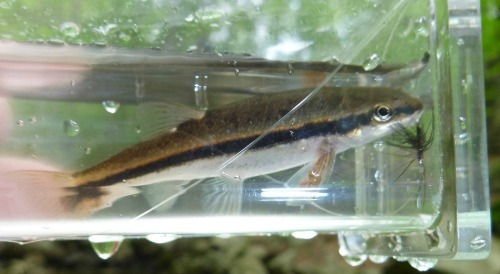 And if you happen to catch a 9" brookie when fishing for black nose dace (which has also happened) you can enjoy the fight without worrying about your rod. And of course, if you are fishing for baby bluegills and happen to see a 10" bass, you can yield to the temptation to cast to it, secure in the knowledge that the rod can handle it. If you fly fish for micros, the Kurenai HM30R can cast a line light enough that you can see it twitch when a black nose dace takes your fly! Do not think that only the HM30R is suitable for micro fishing, though. The HM39R has some significant advantages. Not all micros are skittish, but some are. There will be more than a few times that the difference between a 30 and a 39 is the the difference between not catching and catching. Sometimes bait or fly placement is absolutely critical and with the HM39R you will be able to just lower the hook into the right spot. These rods are an excellent choice for people who enjoy catching smaller fish, whether they are 12" long or 1.2" long. 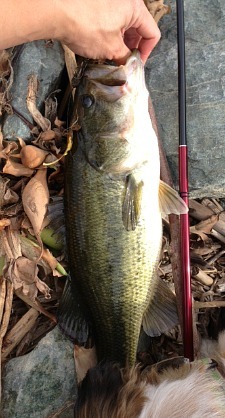 They bridge the gap between fishing and micro fishing better than any other rod. I know that most tenkara anglers are not micro fishermen. Most of the people who buy the Suntech Kurenai will fish for trout. These rods are sensitive enough for micros and beefy enough for trout and modest bass. Plus, they're almost certainly the lightest rods you've ever fished. They are just wonderful rods. One last thing. 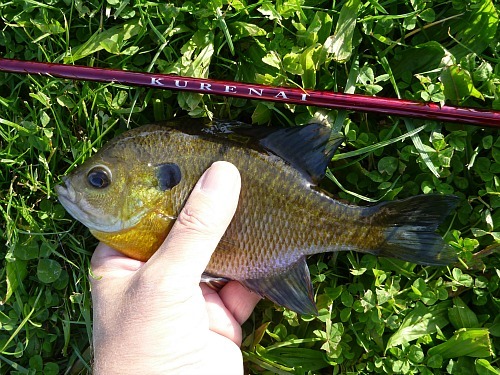 The Suntech Kurenai rods are used in Japan to catch chubs. The chubs there are different than the chubs we have here (much prettier) but they are chubs nonetheless. Personally, I think creek chubs are horribly underrated as a quarry, and are an awful lot of fun with the right equipment (and a Kurenai is definitely the right equipment). The photo below shows a nice creek chub caught by Alan L. You can be sure it put a good bend in the rod! *weights are without tip cap. The Suntech Kurenai grips are smooth to the touch but the covering is still a very effective non-skid finish. A grip that is smooth but not slick may not be what you expect, but it works. A change to the current non-skid grip is what lead to the minor name change - from HM30 to HM30R. The grip is narrower than on the tenkara rods you may be familiar with, but the rod is incredibly light. You grip it with you finger tips, not your palm. I have not felt the grip is too narrow, and I doubt you will either. In Japan, anglers who use similar rods for tenkara fishing occasionally build up the grip with the wrapping material used for tennis racquet grips, but I have never felt it was necessary. The rod has a swivel attachment for the lillian similar to that that used by the high end Daiwa tenkara rods. It really does help reduce line twist and they are carefully engineered so that the tip section easily passes through the #2 section for disassembly. The tip cap has a very snug fit and will not slip off by itself (as I have had happen with tenkara rods from more than one manufacturer). 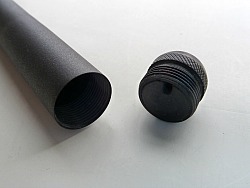 The grip cap has a hole for ventilation, but I would recommend taking the rod apart after each use to let it dry completely. Putting a rod away wet can ruin the finish. Be sure to keep it in a safe place while it is in pieces, though. Suntech is not a name that most Americans are familiar with, and when my supplier in Japan first suggested sending me a couple to evaluate I politely declined. I'd never heard of them and didn't think a rod no one's ever heard of would sell. She then sent an email, in Japanese, to my wife and explained that Suntech made rods for Daiwa before Daiwa moved production to China, Vietnam and Thailand. The Suntech rods are made in Japan and they are beautiful rods. And truly, all it took for me was seeing the rod and then casting it and I was a believer. It was just the same at the show. Once you've seen the rod, handled it and cast it, the name is no longer important. Although actually, the Suntech name now means something here in the US - it means top quality, beautiful rods made in Japan. This wonderful little rod is like the other Suntech rods. It is beautiful and light. It casts like a dream and is so much fun the catch fish with. It does have one problem though: After you have cast and fish this rod all other rods feel heavy and labored to use!! No joke, this rod will spoil you! WOW! What a fishing pole! I was one of lucky people to discover the Suntechs. I got one of the 9'8" rods at the Fly Tying Show. Frankly, I think it is a masterpiece. I am thinking of getting the next size up. I like the weight, action and speed. Is there a size bigger than the 33? Maybe a twelve footer?" The next longer rod is a 39, which is 12'10", 1.5 ounces, same collapsed length. The rod cast the size 3 line so well I couldn't believe it. 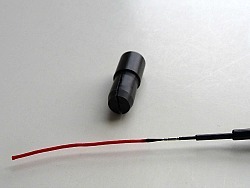 The rod does not have any feeling of tip heaviness or noticeable oscillations at the end of the cast. The Suntech 33 is a pure joy to cast. I received my Kurenai HM33R yesterday and I am impressed. This is my third Tenkara rod but it is my first "premium" one. I purchased it specifically for bluegill and I am already hurting for some warmer weather. 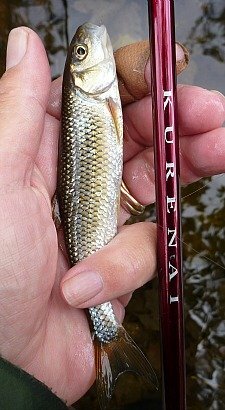 I have had great success with a lower quality rod, however, I could tell the difference in the quality and the feel of the rod in the first thirty seconds of holding the Kurenai. I appreciate your passion for Tenkara and for making such fantastic rods and equipment available to the market place. I finally was able to fish with the Suntech Kurenai HM30. What an amazing rod. I used 9.5' of 3.0 level line that you graciously included with the rod and 2.5' of 7X tippet. It casts a kebari and other tiny flies perfectly. I caught a couple of trout that were larger than expected and it managed them just fine. 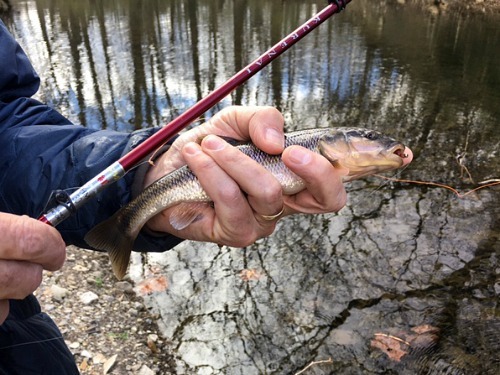 I count myself among the lucky ones in getting this rod...everything you said about it in your review is spot on...it is the perfect tiny creek rod. I'm thinking about getting one of the longer models...just because. I have had a blast the past two days catching tiny (4 - 7") brookies in a high gradient northern XXXXXX county stream and wild browns in a XXXXXX stream. 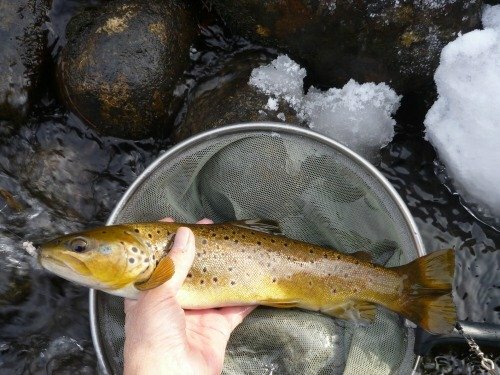 The browns ran 6 -12" (estimated) and my little Kurenai held up well (my tippet not so much on the estimated 12"er). I must say that I have found this type of fishing a refreshing and welcome change. Just to let you know I received the Kurenai HM39R and it looks fantastic but better yet it casts a #3 beautifully. Impressive. Wow!! Hey Chris, I absolutely love the Suntech Kurenai. It is my new favorite rod. All I can say is that with the delicate presentation and sensitivity it is a fish killer. Earlier this week I was fishing for panfish and was surprised to hook up with a 3 lb bass which I am happy to say the rod handled beautifully. Caught a pretty good sized bass underneath floating weed on 4lb test line with a killer bigger. I was amazed that the lil Kurenai could handle it. The rod is lite, smooth, and just beautiful. Shorter than my other rods, but not too much shorter. I'll adjust nicely. Absolute joy to cast. Thank you Chris, probably for the 50th time, for making these exceptional rods available for us fishing nuts. This rod [HM30R] is going to be so right for the creek chubs. When the water got a bit smaller with more overhead cover I switched over to the HM33 and a 3.3M soft Fujino line which it really did cast to perfection as there was absolutely no breeze at all. Tied on a Patriot Wulff and land at least another dozen brookies. 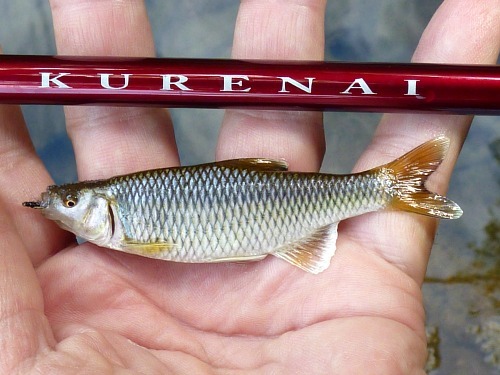 These Kurenai’s are exceptional rods and really beautiful in the scarlet colors. They feel as if they have no weight at all. Again hooked and landed about another dozen fish and knocked off the biggest one, about 11 inches on the way out, he was really a fatty. By the way those Wulff Patriot flies are very effective on brookie water, so you should give them a try. The biggest surprise was that for me [the HM45R] felt much less tip heavy than I expected - probably the result of the overall light construction. It feels very nice in hand. I wanted to let you know how much I am enjoying my Kurenai HM33R. I have caught Bluegills by the dozens, several Bass, Crappie and even a Channel Catfish on a black Killer Bugger. The sensitivity of the rod is amazing and has increased my ability to feel even the slightest take. Thanks for carrying such great products. Thanks for the advice on that Kurenai! I'm in love. Rainy day rainbows on the HM33R and a Utah Killer Bug. My son learned to cast it in about 3 minutes and began catching fish right away. amazing way to deliver small flies to fish. Just a brief note of thanks for the quick delivery of my Suntech HM30R rod and supplies. I've already had it out a few times with great results. This really is the ultimate in ultralight fly fishing. Thanks again. I've had the opportunity to use the Suntech Kurenai 30 that I purchased from you for a couple of months now and wanted you to know how pleased I am. What a buttery smooth, sensitive, FUN rod! Frankly, when I contemplated buying it, I worried that it might not work out for my Central Texas waters. I typically fish lightly-weighted killer bugs, in slightly deeper water, but the rod has really been a delight. I've now caught over 50 stocker trout with it (typical 8"-12" size) and the Kurenai has been an absolute blast. The rod is exceptionally light and beautifully built. It's more capable than one would first imagine. You could combine something like the Suntech Field Master II 39 with the little Suntech Kurenai and handle most fishing situations with style! Just use a light tippet to protect the tip, and you're set to go. Thanks again for offering such superior rods. Hey Chris, I was a little leary when I received the Suntech HM30R but I found a honey hole for bluegills today and found this rod perfect for the job. I lost count of how many I caught today but had the best fishing day ever! Thanks! I caught my 1st fish on the 39R a 10" rainbow in a small but really fast stream. What a battle! I love that little stick. The Suntech Kurenai that I purchased from you years ago is still one of my favorite / most used rods. Just came back from the Conejos in southern Colorado, took the HM39R, two other tenkara rods, and my 5 and 8 weight fly setups. Used the HM39R the whole time, not sure what I'm going to do with all my fly gear . . . The rod was able to land an 18" brown (measured it against my net, not my imagination) without too much difficulty. For some reason, the tenkara setup seems to tire the fish out faster than my fly rods. I really love this rod [HM30R]. 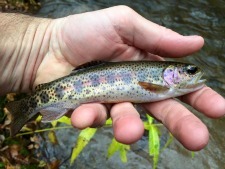 It has served me well fishing for brook trout in the mountains of Maryland and Virginia, as well as fallfish in the local creeks near my home. Had my best fishing day yet in Colorado using the HM45R for the first time. 30+ fish in under 3 hours, 3 to 13 inches. Never had that much control of the fly before. Used the same fly and 7x tippet the entire morning. Thank you.